By descent from the sitter. Sitters' Book II, f.58: Alice Bridgeman, Feb. 8th 1928. N.P.G. Album, 1927-28, p. 23. The Bazaar, vol. CXXI, no. 22, 1 June 1929, illustrated on front cover. De László Archive (DLA) 057-0093, letter from Paul Bridgeman to de László, 20 May 1927. DLA057-0100, letter from de László to Paul Bridgeman, 17 June 1927. DLA057-0097, letter from Paul Bridgeman to de László, 23 October 1927. DLA057-0101, letter from de László's secretary to Paul Bridgeman, 3 January 1928. DLA057-0078, letter from de László to Mrs Bridgeman, 6 February 1928. DLA057-0087, letter from Paul Bridgeman to de László, 9 August 1928. DLA057-0079, letter from Paul Bridgeman to de Lázsló, 7 September 1928. London, The French Gallery. A Series of Portraits and Studies by Philip A. de László, M.V.O., May-June, 1929, no. 17. Philip de László is now recognised as one of the major portrait painters of the late nineteenth and early twentieth century. His great skill in capturing a sitter's likeness and his ability to transpose glamour and vitality onto a canvas often equalled that of Sargent. In a letter dated 23 October 1927, Paul Bridgeman reminded the artist about the commission, and gave him more specific instructions as to what he wanted: 'I had in mind a three-quarter-length portrait about 54 x 44 inches, including the frame [...]. Do you ever include a dog in your pictures because I have one, who is such an undisputed beauty, that I should very much like to include her, if that was possible! "5 This was agreed, and according to the artist's correspondence, it seems de László eventually executed the portrait in January and February 1928,6 having had to cancel some sittings in order to finish the portrait of Princess Theodora of Greece in early January.7 The completion of the present portrait was further postponed by the fact that de László was dissatisfied with his first attempt at portraying Mrs Bridgeman. This resulted in his beginning the commission again, on a fresh canvas. The portrait of Jeannine from the abandoned painting was cut out and framed in an oval as a portrait in its own right, while two preparatory drawings for this painting remained in the artist's studio until his death. 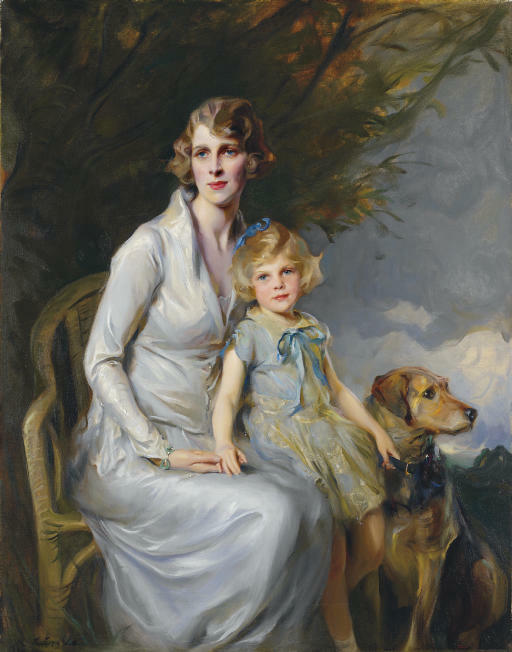 According to Jeannine's sister Marigold, Paul Bridgeman used to tease his wife by saying he had commissioned the present painting in order to have a portrait of Jill, his Airedale. Alice Dorothy Kleinwort was born on 27 April 1896 in London, the fifth of the seven daughters of Herman Greverus Kleinwort, the founder of the bank Kleinwort, Sons & Co. She was educated at home by German, French, or occasionally English governesses, and later spent two years at Northland's School in Surrey. On 11 May 1922, she married Commander Francis 'Paul' Orlando Bridgeman, the son of The Hon. Francis Bridgeman, and nephew of the 4th Earl of Bradford. There were three children of the marriage, Jeannine (born 1923), Marigold (born 1925), and Gerald (born 1929). In 1930, tragedy struck when her husband died in a tree-felling accident. From then on, her life was centred on bringing up her children, and, for the last 35 years of her life, in making her home, Dowdeswell Manor, a centre for her family's activities, multi-ethnic ventures for African students, or Christian groups. She died on 22 January 1979 at her home, in Gloucestershire. Her daughter Jeannine, born on 5 June 1923 in London, was also educated at home by a governess. She was very close to her father, who took her everywhere with him. He taught her carpentry, fishing, gymnastics, and many other activities, until his untimely death robbed her of his companionship. She should have completed her education on the continent when the Second World War broke out, but she stayed in England, where she became an occupational therapist in the Wingfield Hospital at Oxford, treating severely wounded orthopaedic patients. Her first marriage failed, but a love of Africa was instilled in her during those three years. The rest of her life was dedicated to breaking down racial barriers. She assisted Colonel David Stirling in the Capricorn Society, bringing different races together in the early 1950s, and she later founded the Zebra Trust, through which she tirelessly raised money in aid for Africa. The Queen awarded her an M.B.E. for her steadfast work through the years. Jeannine remarried on 18 October 1969, to Admiral Josef Czezlaw Bartosik C.B. D.S.C. She died on 1 April 2007 in Gloucestershire. 3 Today's equivalent of 63,000 pounds. 6 DLA057-0101, op. cit. & 057-0078, op. cit. We are grateful to Dr Caroline Corbeau and to Marigold Bridgeman for their help in preparing this entry. The Hon. Mrs de László and Christopher Wentworth-Stanley are compiling the catalogue raisonné of the artist's work. Dr Caroline Corbeau is the British and French editor. Please see www.delaszloarchivetrust.com or contact catalogue@delaszlo.com for further information.